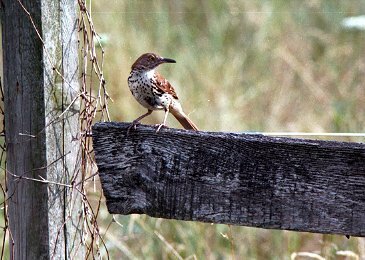 Of our three mimic thrushes, the brown thrasher is the most reclusive - or, at least, it used to be. They have always nested on our property in the past 20 years, but have chosen to nest in the more remote and wilder parts of our 17 acres and have always given me the impression of being quite shy. The exception is while the male is singing from a high perch in early spring. Then, I can walk right underneath him and command zero interest or attention. For a couple weeks, singing seems to be an obsession with them. Many people prefer the thrasher's song to that of the other two mimics, and I am inclined to agree. But, the night singing of male mockingbirds puts that species in a class of its own. Listening to a mockingbird singing on a moonlit night with a great horned owl hooting in the background makes for a perfect evening. The catbird, on the other hand, is a distant number three, not because it lacks a versatile repertoire similar to the other two, but because its constant mewing when I invade its nesting territory is annoying. We have so many catbirds that as soon as I leave the territory of one nesting pair, I enter the next. Unless I walk out into an open field, I am always near the nest of a catbird and my presence is announced by its frantic mewing, making it impossible to sneak up on any other creatures. 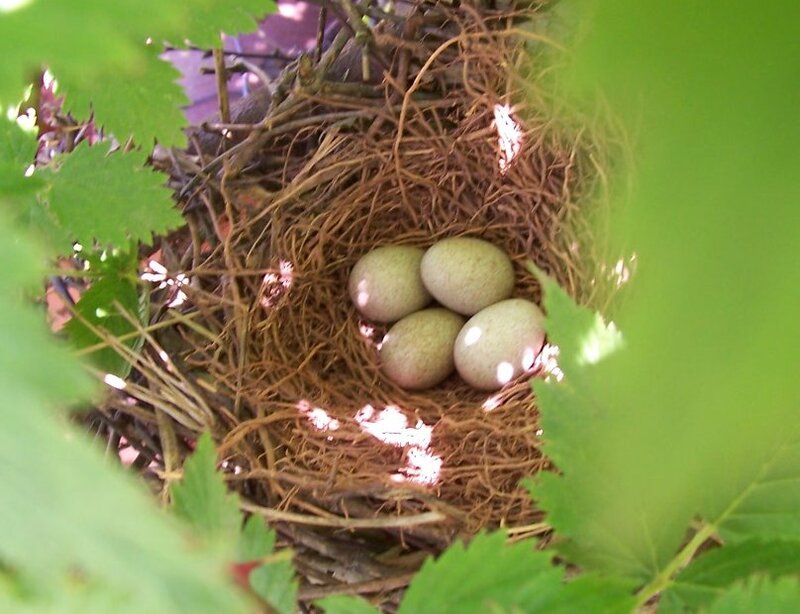 This year, a pair of thrashers built a nest behind the barn in volunteer blackberries that had sprung up among a pile of old implements and parts. This was the first nesting in our yard. Concerned that this small oasis in a sea of (tall)grass lawn would attract predators, I set up a temporary fence of chicken wire in a 30 ft perimeter around the iron pile. While this 3' wire fence could easily be scaled by a raccoon or other predator, I've found that they don't bother without reason. The fence was erected on 5/31/2005 and their clutch of 4 eggs was incubated until 6/5/2005, when 3 eggs were missing and the nest was abandoned. The thrashers were present, but showed no interest in the nest. It appeared that a small creature had gotten the eggs, since the nest, supported on slender new growth cane, was undisturbed. On 6/6/2005, the last egg had been removed. I should have set up a video cam to see what would take the last egg, but, this wouldn't necessarily have been what took the first three. Black rat snakes have not been observed in our yard (and they are hard to miss), but chipmunks have claimed every square yard of this area and have been seen robbing nests before. Grackles are also nesting in the yard this year, since I didn't get around to discouraging them in early spring. 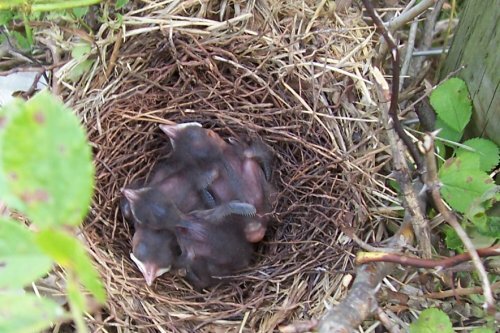 But, I would think the thrashers could have defended the nest against several grackles. I had been waiting for the eggs to hatch before installing the video cam, thinking the nest was fairly safe from predation. 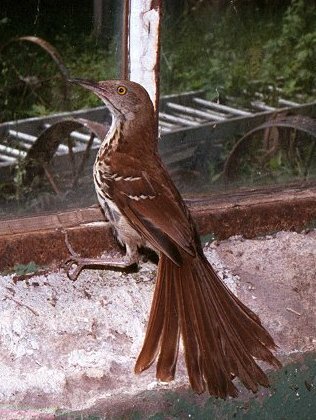 The brown thrashers soon built a second nest nearby, which was intermittently videotaped. See the link below. &COPY; 2005 - 2013, American Artifacts and Richard Van Vleck, Taneytown, Maryland.